Special pricing requires 1yr service plan activation. As the world’s first BGAN M2M terminal designed to operate on both Inmarsat BGAN (Broadband Global Area Network) and cellular 2G/3G/LTE networks, EXPLORER 540 delivers always available connectivity for critical monitoring and control applications. The BGAN M2M service uses Inmarsat BGAN to provide a reliable, global, two-way IP data service. 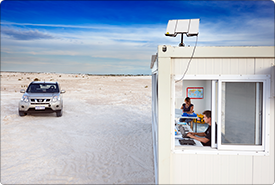 It is designed to connect monitoring and control applications in remote, unmanned locations, providing visibility and management of those assets. By combining BGAN M2M with cellular connectivity in the same terminal, EXPLORER 540 gives users the opportunity to choose the best carrier for any location. EXPLORER 540 is the only Inmarsat BGAN M2M terminal to offer dual mode operation, which provides unique flexibility and M2M data communication cost-control, as it ensures the most cost- effective communication service can be chosen depending on location. Securing continuity of M2M IP data transfer, which often originates in hard to reach, remote locations, dual-mode operation delivers significant failover capabilities with automatic switching between BGAN and cellular networks. For organisations transferring critical real-time data within their M2M networks, EXPLORER 540’s dual mode can provide unmatched service availability. The terminal is well suited for bespoke M2M solutions such as IP SCADA for data backhaul, asset tracking, real-time surveillance and remote telemetry. 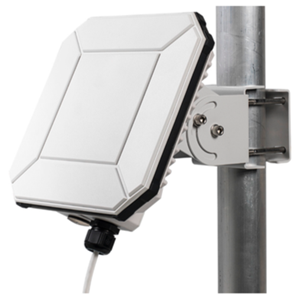 EXPLORER 540 is a rugged M2M terminal designed to provide reliable and secure IP data in even the harshest environments. At 20 x 20 cm and just 1.6 kg, it is the smallest and lightest BGAN M2M terminal in the market today. The durable casing and a dust and water resistant IP66 design makes EXPLORER 540 the perfect choice for any kind of fixed installation outside or inside. Automatic failover between BGAN and the cellular network ensures continuous connectivity. OCENS has some of the best airtime plans available for your BGAN system. Please see service agreement for current rate plans.